The explosion in the popularity of running and physical activity began in the 1970s. Along with this interest in physical activity came the development of sport-specific shoes with an emphasis on the biomechanics of footwear. 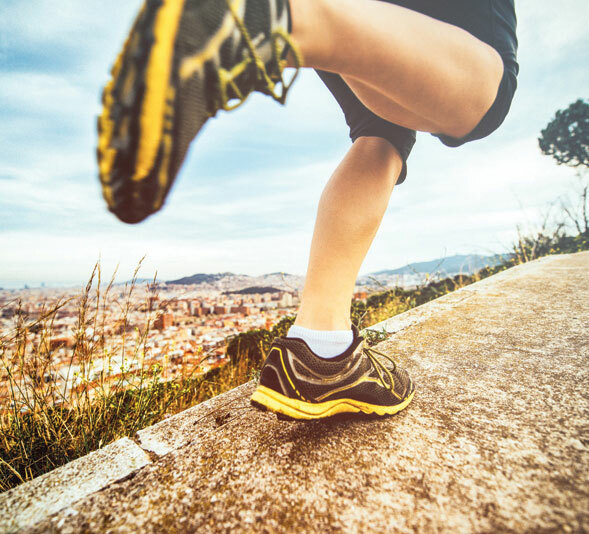 Since this interest in physical activity began, the evaluation of running footwear has focused on two guiding principles for footwear design: 1) decreasing the risk of running-related injuries, and 2) improving performance. The purpose of this paper is to present an overview of the parameters used to evaluate footwear in order to reduce the risk of injury; performance enhancement will not be addressed at this time. This paper will present the parameters investigated by most footwear scientists in the early years of footwear research and why we sought to link these parameters to injury. Lastly, this paper will attempt to look into the future and suggest some different parameters and methods for footwear design that may be helpful in efforts to reduce running-related injuries. 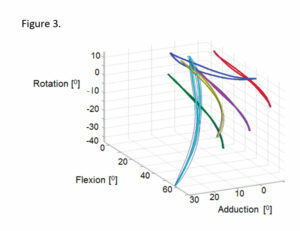 Figure 1a shows differences in the peak acceleration associated with midsoles of varying hardnesses, assessed using an impact-testing device. Figure 1b illustrates that the impact peak differs very little among the same three insoles. It can be inferred that softer materials do not necessarily result in better cushioning, and, subsequently, that softer materials do not necessarily reduce the external forces applied to the runner. The concept of a relationship between impact forces and injury was initially derived from animal studies in which the joints of animals were subjected to numerous repeated impacts.4 In a study by Radin and colleagues,4 joints were significantly degraded, suggesting the repeated impulsive impacts were deleterious. More recent evidence, however, suggests high-impact loading is not necessarily linked to running injuries. For example, several studies have reported that knee osteoarthritis was found in equal frequency in runners and nonrunners,5,6 despite runners experiencing more foot-ground contacts. Further, in a recent publication, Miller reported joint loading in runners does not initiate knee osteo­arthritis.7 It appears that, unlike previous thinking, high impact peaks nor high loading rates do not relate to injury.8 However, in the biomechanics literature, a number of researchers continue to cite studies that support a relationship between vertical GRF parameters and injury. 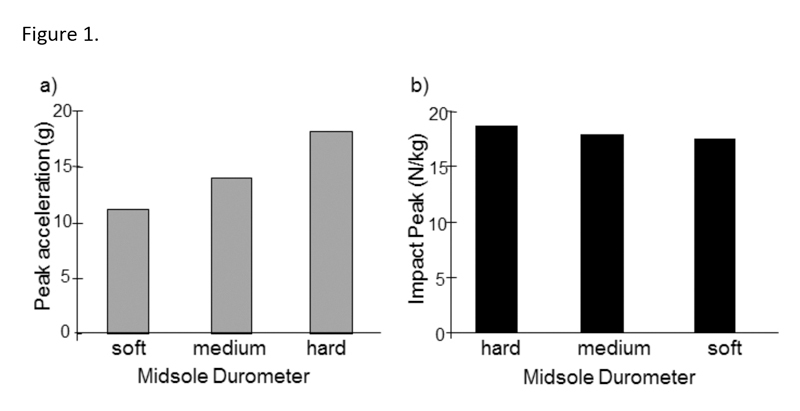 Figure 1: a) Midsole durometer tested on an impact machine. 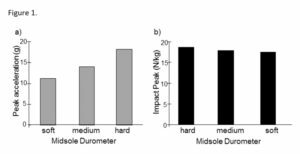 b) Midsole durometer tested on participants running across a force platform with no statistical differences among footwear midsoles (unpublished data). theory of rearfoot instability as a risk factor involved the coupling and timing of calcaneal eversion, tibial internal rotation, and knee flexion during support.8 It was postulated that too much eversion (ie, “excessive” pronation) and extraneous rearfoot movements increased the risk of injury, particularly to the knee. Neither of the assumptions concerning too much eversion and extraneous rearfoot movement has been shown to be true.8,11 For example, in a one-year epidemiological observational prospective cohort study with 927 novice runners, Nielsen et al found foot pronation was not associated with increased injury risk.11 Nigg suggested footwear designs make little difference in the degree of pronation.8 Our own unpublished data with 10 participants suggest considerable midsole variations result in little difference in maximum pronation value during running (see Figure 2). The footwear in Figure 2 had different midsole densities and different degrees of posting, resulting in different midsole variations that should have affected rearfoot pronation, but did not. 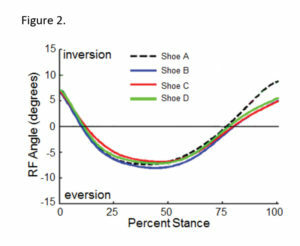 Figure 2: Rearfoot angles for four footwear types with large differences in midsole construction but with little difference in maximum pronation (unpublished data). The current state of footwear evaluation has not changed the focus of footwear research or footwear design. Many researchers and footwear manufacturers are still using the cushioning or rearfoot stability paradigm as a basis of injury risk reduction. A large number of these studies have contributed to interesting and beneficial footwear technologies, such as gels, encapsulated gases, and high-density plastics. But the ultimate goal of reducing injury risk through improving footwear design has still not been achieved. Modern instruments and methodologies have allowed significant questions to be addressed, but these questions are still based on previously used paradigms. Today, researchers use 3D kinematics and kinetics, electromyography, magnetic resonance imaging, optimization, forward dynamics, and more to analyze footwear. However, at the 2015 Footwear Biomechanics Symposium of the International Society of Biomechanics Footwear Biomechanics Group held in Liverpool, UK, keynote speaker Darren Stefanyshyn, PhD, suggested that, quite possibly, biomechanists have been looking at the “wrong measures” in the evaluation of footwear. In the future, new measures or new paradigms must be adopted if the goal of reducing the risk of injury is to be achieved. In his 2010 book, The Biomechanics of Sport Shoes,12 biomechanist Benno Nigg, PhD, suggested we rethink our notions of cushioning and pronation as risk factors for running-related injuries. Nigg’s alternative paradigm was what he termed the “preferred movement path.” He suggested there is a subject-specific and task-specific preferred locomotion pattern determined by many factors (eg, muscles, tendon, ligaments, bone structure) and that this preference for a particular motion path may explain why shoes have only a small or moderate effect on lower extremity kinematics. This new paradigm has given researchers food for thought, and may lead to new assessment goals, such as how footwear may affect the determination of a runner’s deviation from his or her preferred path. A runner’s preferred movement path may be interpreted in many different ways, one of which relates to the movement of the whole body as a system rather than the movement of a single joint. Multiple joints and segments of the lower extremity interact to produce a smooth and efficient movement path. Thus, if each individual has a unique preferred movement path, deviations from the ideal path would result in significant muscle adaptations. Analysis techniques based on dynamical systems theory13 may be appropriate for assessing these types of coordinated body movements during running, and could lead to a more fruitful evaluation of running footwear than what has been used in the past. As an example, Taunton and his group1 identified the knee as the most prevalent injury location in runners. It may be that focusing on a single parameter such as calcaneal eversion is too narrow a view, which would help explain why previous literature has produced mixed results. Rather than footwear affecting the knee directly, it may be that the hip or ankle are affected by footwear, and alterations in these joints cause deviations at the knee that can lead to injury. Analyzing how the knee interacts with other joints using a holistic or coordination analysis may help us better understand the actual mechanisms underlying the many knee injuries that occur in runners. 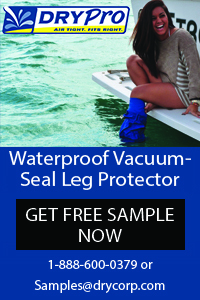 Then, in turn, we may be better equipped to answer the question: Can footwear reduce the risk of these injuries? The holistic analyses may also help reveal functional groups of runners, some of which may be more or less susceptible to injury. It is very difficult to ascertain and quantify a runner’s preferred movement path. Rather, it may be easier to determine their habitual path or the path they commonly use. One footwear company has conducted research to develop a paradigm relating the choice of footwear to their habitual path, or their habitual joint motion path (HJMP). To begin, it was determined the knee should be the focus of the paradigm, since the largest number of running-related injuries involve the knee.1 In an unpublished cadaveric study, it was found that knee motion was highly repeatable within an individual but not between cadaver limbs from different individuals (see Figure 3). To determine the HJMP path at the knee, 3D lower extremity kinematics were assessed as runners performed a squat to a designated position and as they ran in a shoe with a minimal midsole. The difference between the squat knee position and the knee position during running was determined to create a deviation value. 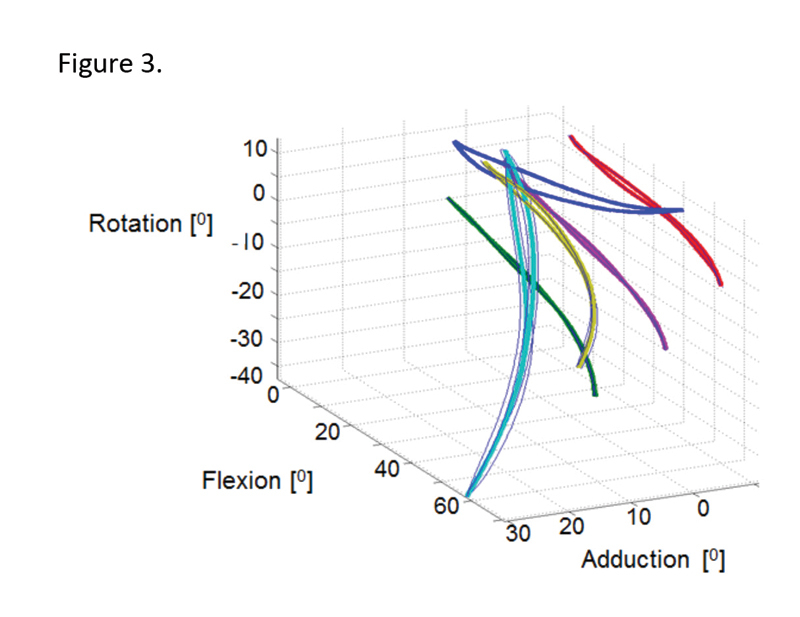 Figure 3: A 3D plot of the forced knee motion of different cadaver legs over five flexion cycles, illustrating the within-leg consistency and the between-leg differences. Each colored line represents a cadaveric limb from a different individual. This deviation value allows runners to be classified as low deviators or high deviators. In the case of the low deviator, a neutral shoe would suffice. However, in high deviators, depending on how or in what direction the deviation occurred, a shoe to return them to their HJMP could be recommended. Such an analysis is currently being used in many technical running stores across the US and Europe to evaluate runners for footwear recommendations. Other directions for the evaluation of running footwear also show promise. The concepts of the “eversion buffer”14,15 (ie, the pronation angle relative to the passive range of motion) or the prolonged loading bone stress16 have been used to illustrate differences in injury risk between groups and between shoes. Rodrigues et al15 reported individuals with a smaller buffer would be at a greater injury risk, while Firminger and Edwards16 suggested minimalist running shoes would show greater bone stress over a lesser cumulative distance. Other suggestions include using in-shoe sensors to evaluate footwear during both steady state and fatigued conditions, which could also help generate large quantities of data for population-based analysis of running parameters in multiple environments. Lastly, great strides have been made in the development of analysis techniques for evaluating footwear. Techniques such as principal components analysis,17 functional data analysis,18 and dynamical systems analysis13 can be used with large quantities of data to evaluate footwear. While running footwear can be a risk factor for injury, it is not the main or most significant factor. 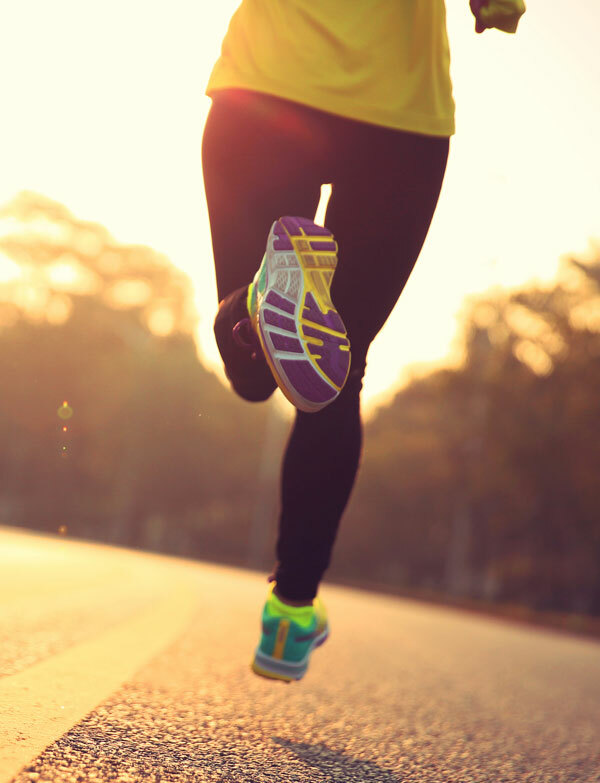 Research conducted in the past has produced excellent footwear, but we cannot state definitively that footwear has reduced the risk of running injuries. From the current research, it may be ascertained that the traditional parameters (ie, cushioning and pronation) used to define injury risk have not produced footwear that has actually minimized that risk, as observed by the lack of change in injury rates in runners. This suggests new paradigms must be evaluated. Nigg’s preferred movement path and the concept of the habitual joint motion path are suggested as future areas of research. These paradigms and others could be valuable tools in the future for evaluating running footwear. 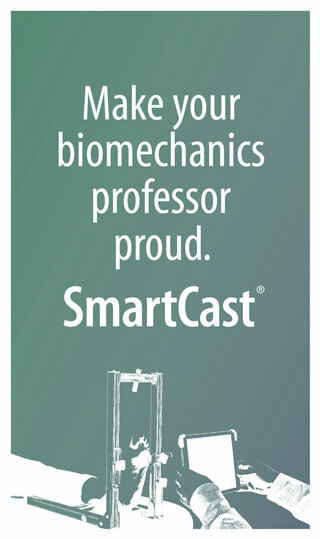 Joseph Hamill, PhD, is professor emeritus and Gillian Weir, PhD, is a postdoctoral fellow in the Biomechanics Laboratory of the Department of Kinesiology at the University of Massachusetts Amherst. Taunton J, Ryan MB, Clement DB, et al. A retrospective case–control analysis of 2002 running injuries. Br J Sports Med 2002;36(2):95-101. Frederick EC, Hagy JL. Factors affecting peak vertical ground reaction forces in running. Int J Sport Biomech 1986;2(1):41-49. Hardin EC, Van Den Bogert AJ, Hamill J. Kinematic adaptations during running: Effects of footwear, surface, and duration. Med Sci Sports Exerc 2004;36(5):838-844. Radin EL, Paul IL. Response of joints to impact loading. Arthritis Rheum 1971;14(3):356-362. Lane NE, Bloch DA, Jones HH, et al. Long distance running, bone density and osteoarthritis. JAMA 1986;255(9):1147-1151. Eichner ER. 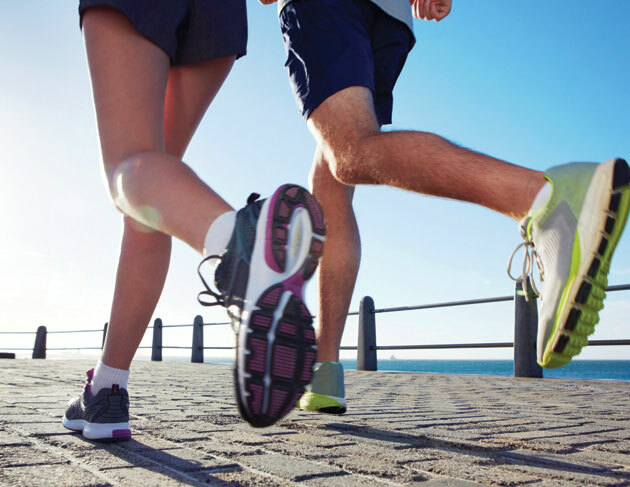 Does running cause osteoarthritis? Phys Sports Med 1989;17(3):147-154. Miller RH. Joint loading in runners does not initiate knee osteoarthritis. Exerc Sports Sci Rev 2017;45(2):87-95. Nigg BM. The role of impact forces and foot pronation: A new paradigm. Clin J Sports Med 2001;11(1):2-9. Bates BT, James SL, Osternig LR. Foot function during the support phase of running. Running 1978;24-31. James SL, Bates BT, Osternig LR. Injuries to runners. Am J Sports Med 1978;6(2):40-50. Nielsen RO, Buist I, Parner ET, et al. Foot pronation is not associated with increased injury risk in novice runners wearing neutral shoe: A 1-year prospective cohort study. Br J Sports Med 2014;48(6):440-447. Nigg BM. Biomechanics of Sports Shoes. Calgary, Alberta, Canada: University of Calgary; 2010. Hamill J, van Emmerik RE, Heiderscheit BC, Li L. A dynamical systems approach to lower extremity running injuries. Clin Biomech 1999;14(5):297-308. 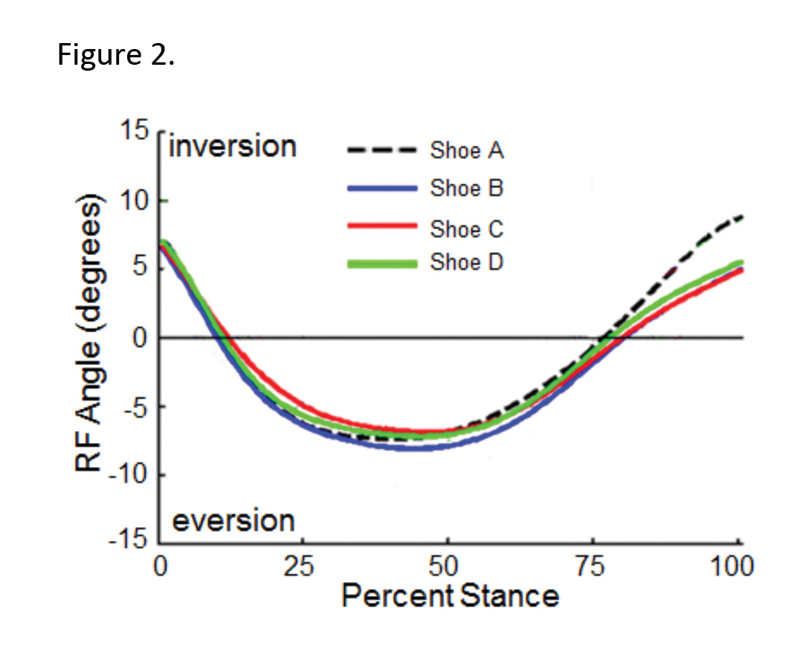 Engsberg JR. A new method for quantifying pronation in overpronating and normal runners. Med Sci Sports Exerc 1996;28(3):299-304. Rodrigues P, TenBroek T, Hamill J. Runners with anterior knee pain use a greater percentage of their available pronation range of motion. J Appl Biomech 2013;29(2):141-146. Firminger C, Edwards B. Effects of minimalist footwear and stride length reduction on the probability of metatarsal stress fracture: a weibull analysis with bone repair. Footwear Sci 2017;9(Suppl 1). Federolf PA, Boyer KA, Andriacchi TP. 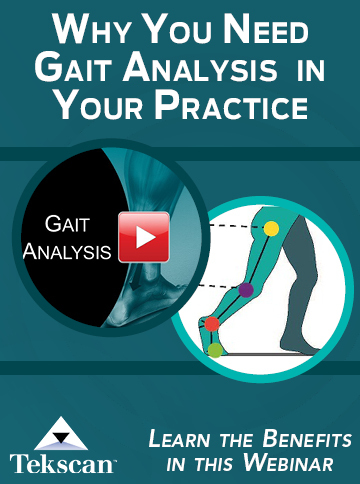 Application of principal component analysis in clinical gait research: Identification of systematic differences between healthy and medial knee-osteoarthritic gait. J Biomech 2013;46(13):2173-2178.